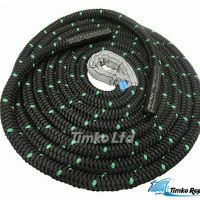 35mm Black Double-Braided Polyester Battling/Fitness Rope. This rope is made through a special double-braiding process that creates an soft and extremely strong rope. They are built to withstand rigorous use and will last for years to come. They are very comfortable to hold onto and will not shed, making them ideal to use indoors or outdoors. 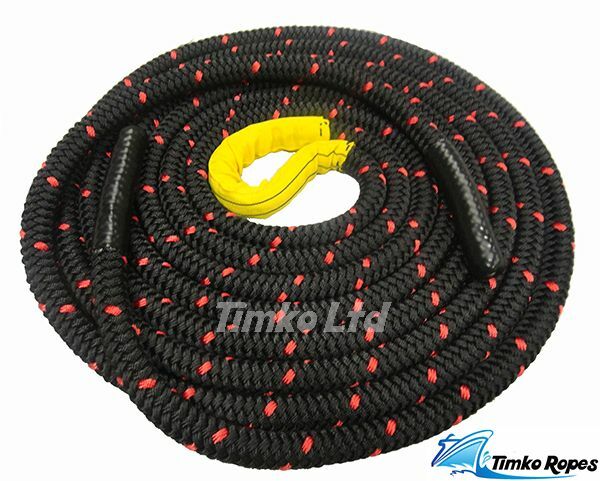 They have an excellent strength ratio and are heavy ropes to use. They also have a high abrasion resistance and due to them being double-braided, they won't stretch like some 3-strand nylon or poly ropes. They are available only in black with a fleck which is an ideal colour for hiding dirt and other wear. Like all our battling/fitness ropes, they come standard with heavy-duty vinyl handles on both ends. These are attached by using both extra adhesive and also stitching between the vinyl and rope - it's an extra step that you will really appreciate when the handles don't fall off after a couple of uses. Also they come standard with heavy duty nylon fabric sewn to the centre of the rope to help prevent fray. You won't find a higher quality battling/Fitness Rope anywhere. The Benefits of Using Our Battling/Fitness Ropes? 1) Great for strength, power and endurance. 2) Increases aerobic and anaerobic capacity. 3) Develop a better grip strength. 4) Provides a incredible full body workout, including great trunk conditioning. 5) Alternative cardiovascular training that is low-impact yet high-intensity. 6) Simple to immediately adjust workout intensity for individual needs, without having to adjust equipment. 7) Ultilzes natural movements with a high functional carryover. 8) Safe and fun for all ages - will make you feel like a kid again! How Do You Use Our Fitness Ropes? 1) Grappler Toss moves, where you are creating internal & external rotary movements. 2) Up-and-Down Waves, Alternative/Reciprocating, Criss-Cross movements. 3) Adjusting your reps & durations, with high intensity interval training being particularly effective with ropes. 4) Incorporating Squats & Lunges, including forward, reverse & lateral movements as well as adding in lower body plyometric movements like jumping squats, lunges & lateral hopping movements. 5) Even changing the grip to where the end of the rope is facing up is a great variation with an added challenge. 6) Train solo & with a partner, you can have another training partner "call out" movements to keep the exercise unpredictable & fresh, increasing your reaction time. 7) Vary your training position, from standing & kneeling to sitting on a stability ball, or even laying face down doing single arm waves.